We got our flattop griddle out of storage recently so we've been doing teppanyaki style cooking. The 4 burners let you have 4 different temp zones, I set up 3 for this type of cooking. Teppanyaki is a Japanese method of cooking on an iron plate griddle. Americans mostly associate teppanyaki with the Japanese steakhouses like Benihana. One of our long term friends is half Japanese and told us that no one in Japan goes to anything like that, just tourists. It's not "traditional" but that didn't stop her from loving to go with us to Shogun (the now defunct, local Benihana knock off). She enjoyed the food and entertaining chefs as much as we did. You don't have to have a flattop griddle to do teppanyaki but it sure helps. You can use a griddle like the Sizzle Q on top of a grill or an electric griddle, but you will lose capacity and variable temperature control. Plus you can't use metal utensils on most electric griddles because they have non-stick coating on them. 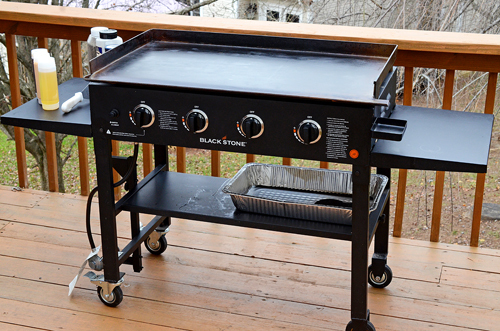 The particular model that we have is a Blackstone 36", four burner flattop. We have had ours for about 16 months and have used it for work functions, onsite cooking events, and at home. It's somewhat portable (legs fold up and the arms come off) and it's well made. The griddle top is very thick and weighs more than the rest of the griddle combined. It's durable and is going to last eons. I know several grillers that have bought one as well as our favorite local cafe and all of them seem very happy with theirs too. So this particular evening, we were making steak and scallops but the teppanyaki style restaurants typically start off every meal with the same three appetizers - ginger dressing salad, mushroom broth, and shrimp. Here's how we do ours. This is very basic. It's just iceberg lettuce, a little shredded carrot, and ginger dressing. If they are really feeling fancy, they might shred a tiny bit of radicchio in there too. 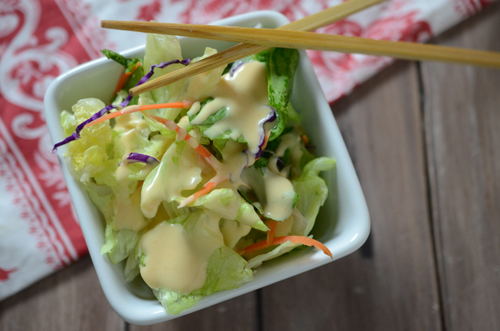 The key is the ginger dressing since that is where all of the flavor comes from. It's slightly sweet on the front followed by a pungent tang on the backside. We have tried many but I haven't found a bottled ginger dressing that tastes like what they serve in restaurants. We make our own Ginger Salad Dressing. You can have any dressing you like, just as long as it is ginger. 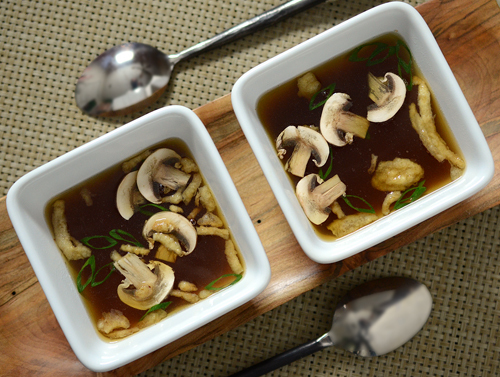 The soup is almost invariably mushrooms and scallions in a clear broth. If you're lucky, there's some fried tempura batter in there too. I found this recipe a while back and it works very well. With such a simple soup, quality fresh ingredients is the key. Slice your own mushrooms, razor thin is best. Broth from bullion or base comes out a little cloudy so I like using either homemade or Progresso broths for this. 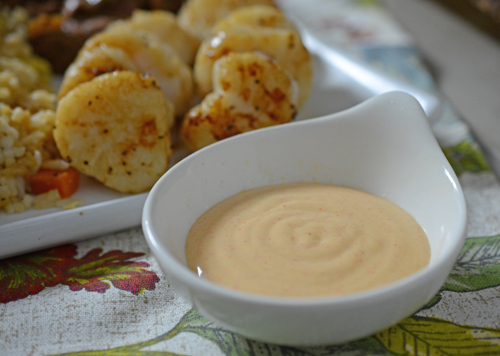 This is another simple but flavorful appetizer where quality counts. I used wild caught Carolina shrimp (21-25 count/lb), plan on 2 to 3 shrimp per guest. You have to make the Golden Shrimp Sauce to go along with this, it tastes so good. Preheat griddle to medium high heat. Squirt a bit of oil (canola oil with a few drops of sesame oil mixed in) onto the hot griddle and spread around with your spatula. Melt 4 tablespoons of butter and mix with a minced clove of garlic, 1/4 teaspoon of fresh grated ginger, and 1 teaspoon of lemon juice. 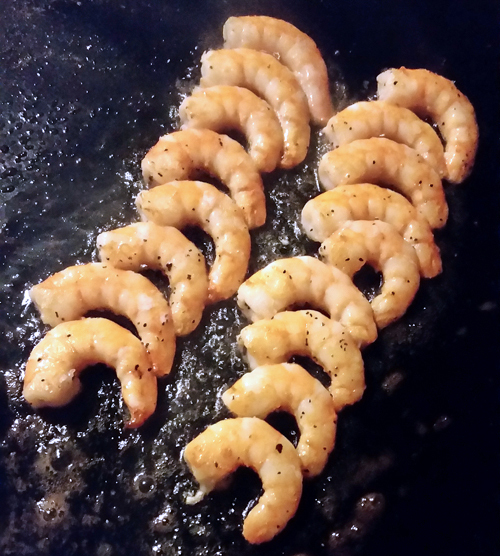 Put the shrimp down, sprinkle with kosher salt, black pepper, and granulated garlic, cooking for 3 minutes. No measurements, I just sprinkled it on. Flip, season again with salt, pepper, and garlic, then cook 1 minute. Pour the butter mixture over the shrimp and cook until done, another 1-2 minutes. Keeping them lined up like this makes it easy to flip with your spatula in one swoop for each row. The Golden Shimp Sauce ends up going on just about everything for me except the beef. Especially on leftover fried rice the next day, so much goodness! So that's our first three courses for any teppanyaki meal that we create. Pretty basic stuff but just remember - don't take any quality shortcuts. Coming up in my next post - Teppanyaki Steak and Scallop Dinner. [FTC Standard Disclaimer] We have no affiliation with Blackstone, received no compensation for this post, and paid full price for our griddle.